I really like that these markers match your other inks. Will it be possible to refill them with re-inkers? These are superb colours and they will compliment your range so well. Thank you to the amazing designers for their incredible inspiration. Stunning projects from all the designers. Watercolors look like a lot of fun. Learning how to watercolor. Can’t wait to give your watercolor brushes a try! I love these watercolor markers. Very versatile! I’m excited about this new release! I love the watercolor look on cards and these markers are gorgeous! Love the beautiful colors of these markers. Thanks so much for the inspiration! I always say go big or go home. Love these! Love the colors of the Winter Wonderland set. They are great. I am just learning how to use watercolor. I love the colors in this set. They are so beautiful! I’m a novice watercolor painter, just getting started. I’ve seen these watercolor pens advertised and I’m very curious about them. I bet they are great for traveling… I’m going to Puerto Rico next month. I’d love to try them out!! I’ve seen these watercolor pens advertised and I’m very curious about them. I bet they are great for travel and plein air work … I’m going to Puerto Rico next month. I’d love to try them out!! Love the colors of the markers and the card ideas for inspiration. What beautiful and vibrant colors. I’ve only watched Kelly’s video so far, but I’m definitely headed out to watch more. Really, the colors and cards are all stunning. luv the addition of metallic silver! These look incredibly convenient. I’d love to give them a try. I think I like the colors in this set better than the Spring Set. The blog hop was amazing and showed us so many different ways to use the markers. Absolutely love the colors! Swoon! I can think of some many beautiful cards I can make with these. I love the watercolor look on cards and these colors of the markers are gorgeous! I think I’m in love with these new pens ! There’s so much that can be done with this medium, and then convenience by having the colors already loaded for you! Love these! love love love these cards: colorful, classy, and great for every occasion, including birthdays and weddings. This stamp set is a must for my small colleaction. Wonderful, vibrant colors, what’s not to love, watercolor made easy! I love the bright bold colors of the markers!! Just Beautiful!!! Beautiful cards! The brush markers look like fun! Thanks for the opportunity to possibly win a gift certificate! 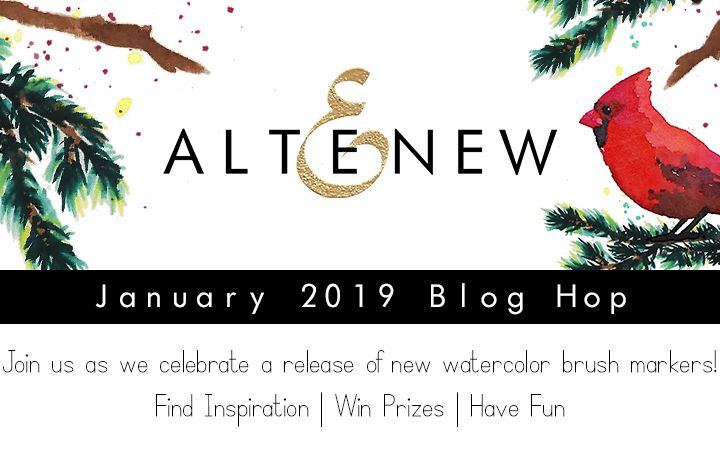 As always Altenew delivers beautiful “must have” for the craft room items! The markers look like lots of fun! These markers look right up my alley! I love all the colors! I have attempted watercolors, but not liked my outcome…these may just do it!! This looks like an amazing set of markers. Love the new release. Colors are fabulous. Love these “winter” colors. Can’t wait to try them out. I am just learning to watercolor – These would be so fun to use! Thanks! Love the new release. The colours are really pretty. And I love the silver pen. I hope more metallics are in the pipeline! The inspiration by the DT is realy amazing! I really love these colors. I am definitely getting these and my next art is going to be prepared from these for sure. I am fairly new to water coloring. I’m am excited about the ease of these pens!